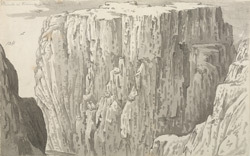 A view in ink of birds' nests in the cliffs of Pinnacle Island, one of the Staple or Farne Islands, off the Northumberland coast. The Farnes were formed by the seaward outcrops of the Great Whin Sill volcanic intrusion, which extends from Upper Teesdale to the north coast of Northumberland. Volcanic deposites give the Farne island their distinctive blackened appearance. The islands remain a major breeding ground for otherwise rare British seabirds.